Summer and autumn are the best seasons for vegetarians in the country, but there are plenty of food choices even in the colder months. When I lived in Russia between 2003 and 2007, I had absolutely no problems adjusting to the country’s traditional culinary habits. I particularly enjoyed the variety of sausages and meat and potato dishes, as well as the great seafood that is available in plenty in Sakhalin. After becoming a serious yoga practitioner this year, I have shied away from non-vegetarian food to the point where I may prefer to go hungry rather than eat some of my erstwhile favorite dishes. This summer, I made it absolutely clear before accepting lunch or dinner invitations in Sakhalin or Vladivostok that I no longer eat meat. This saved my hosts the trouble of preparing something lavish, only for it to not be eaten. Being a vegetarian in Russia is not as difficult as it is made out to be. Of course, Russian vegetarian cuisine lacks the variety that we are used to in India, but there is no question of a vegetarian starving in Russia. For starters, Russia has an excellent baking tradition and there are several delicious varieties of bread that are available just about everywhere. My favorite variety over the years has been Russian rye bread. This dense, dark-colored bread has a slightly sour taste. Russian buterbrod, an open-ended sandwich tastes fine with just fresh lettuce and cheese, although many people prefer cold cuts or caviar on the bread. There is also a great variety when it comes to cakes and pastries, but then most of what you would find in a common store is probably not eggless. One could argue that there is no difference between eating an unfertilized egg and drinking milk, but I won’t get into that argument here. Russians also eat some dumplings that do not contain any meat. Known as vareniki, the dumplings are filled with mashed potatoes, cabbage, sauerkraut, cottage cheese or even cherries. They are quite close to the vegetarian momos that are available in Nepalese and Tibetan restaurants in India. Summer and autumn are the best seasons for vegetarians to visit Russia. Fresh and delicious vegetables are farmed on private land holdings within the compounds of dachas (summer cottages). A family I know in Sakhalin grows vegetables and various plants, including three varieties of mint, each of which adds great flavor to black tea. This summer, I had the privilege of eating dacha-farmed beetroot, tomatoes, lettuce, zucchini and cucumbers. The salads laced with olive oil and locally grown spices were some of the best I have ever eaten. Mid-summer is also mushroom season and there is a range of soups and salads that are made from wild mushrooms. 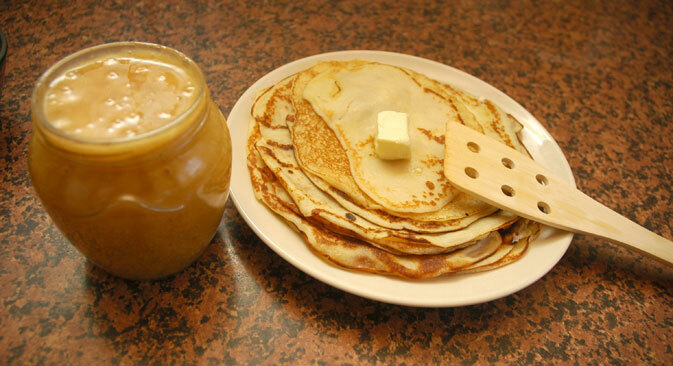 Vegetarians can also enjoy blini, Russian pancakes that are like French crepes. Note that they are made with eggs. Blinis taste great with honey, jam or sour cream. If you want something savory, try them with fried mushrooms or cheese. My favorite vegetarian variant of a Russian dish is golubtsi, cabbage rolls, where meat is substituted with rice, mushrooms and diced vegetables. A close second would pirzohki, baked buns that are filled with mushrooms, potatoes, cabbages or eggs. These buns are sold in stalls, small shops and cafes across Russia, and can be quite filling. Of course, when it comes to Russia’s famed soups, many families use a broth with meat, even if the rest of the ingredients are vegetarian. It is quite easy to make these soups without any meat, as Elena Revinskaya has explained in these articles on Russian cuisine. It is unlikely that you will get a “pure veg” version of a Russian soup at a friend’s home in a far off Russian region, but it is easier in Moscow and St Petersburg. Both these cities also have good Indian restaurants with vegetarian food, but then why not try something new when abroad? I’ve eaten vegetarian borsch in restaurants in St Petersburg and did not notice anything different in the taste from the version with meat. It’s obvious that vegetarianism and veganism are spreading at a much quicker pace in Moscow and St Petersburg than in smaller towns. This probably has to do with the fact that Europe and its trends are more accessible for residents of these cities. It is also easier and far less expensive for foreigners to visit Russia’s two largest cities. Of course, trends that originate in Central Russia spread far and wide across the country, and it may not be too long before we have a vibrant vegetarian and vegan scene develops even in the Russian Far East. Vegetarians can easily eat well even in the winter months in Russia. The supermarkets have imported vegetables, which don’t compare to the fresh dacha-grown variety, but are edible enough. Those on short-term visits, without access to a kitchen, are spoilt for choice when it comes to Italian restaurants in most Russian cities.